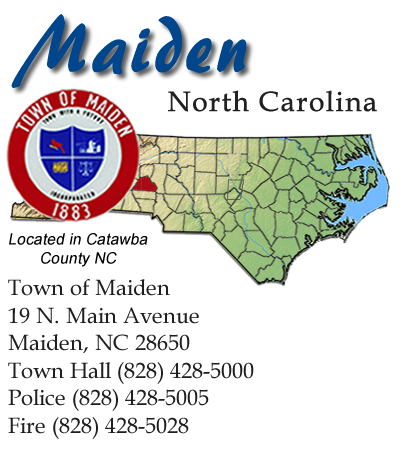 The Town of Maiden is working to protect our local streams from being damaged by stormwater pollution. When it rains, pollutants such as fertilizer, oil, grease and pet waste are picked up from the ground and carried into the nearest storm drain down the street. The storm drains are not connected to a treatment system, so everything that flows down the drain goes directly to the nearest creek, river or stream. Click here to learn more about how stormwater pollution occurs. Take action with easy steps you can take to prevent stormwater pollution. Report stormwater problems you see in the community. Involve citizens in developing and implementing the Town's stormwater program. Reduce and eliminate pollution resulting from municipal activities. Litter Sweep (Spring and Fall). Addressing school and community groups. Storm drain marking (future activity). If you and/or your community group would like to become involved with the Town's stormwater activites or sponsor your own event, please contact Town Planner Sam Schultz at (828) 428-5000. Town staff will be happy to work with you.